The transition towards knowledge society and economy is considered a new trend in the global economy. This transition has become a necessity especially for emerging economies, which are suffering from a large dependency on rentier sectors and low technological competitiveness. However, this process requires clear and effective policies to fit the needs of those countries and available resources. The aim of this study is to run a horse race in between knowledge society and knowledge economy with regard to their development impacts in Russia. We find that knowledge society has a significant impact on development indicators while knowledge economy has negative effect on development indicators. We recommend that developing countries should prioritize knowledge societies on knowledge economies to realize the development benefits. The value of the average number of Internet users is considered a low value compared with the average in the world (49%). As for the value of the standard deviation, it is a good value reflecting the increase in the number of Internet users in Russia. The average number of broadband subscriptions in Russia is low, and that the rate of increasing in the number of subscriptions in total is considered low compared to developed countries. The degree of spread of broadband users in Russia is considered low compared to the number of the population that exceeds 140 million. The average number of individuals with higher education in Russia is one of the best rates in the world, and this value is expected to increase in the future. Average spending on education as a percentage of GDP in Russia is considered a medium value according to the human development index, and the standard deviation shows positive trend towards an increase in this percentage. The average value of the GDP per capita in Russia is lower than the world average $9995, with regard to the value of the standard deviation. The years following the global financial crisis showed improvement in per capita GDP in Russia, where it was $14,487 in 2013. The average value of GINI index in Russia is high compared to developed countries. It expresses great income inequality in Russia. The average unemployment rate in Russia is low compared to developed countries, and that this rate live kind of stability. The size of spending on research and development in Russia is modest compared with the leading countries in the world such as America, but it is important to note that there is a gradual increase in the size of the allocated funds for these activities. Russia has a good number of research and development institutions if we take into account the size of the spending on research and development activities. The number of patents registered in Russia is low compared to developed countries, but recently, we note a marked increase in the number of patents registered and in the number of patent applications. E-commerce sector in Russia is considered a promising sector, as the 30 million Russian citizens used the Internet in the buying and selling operations. The average value of the knowledge economy index in Russia is low and we note that there are increases, but these increases are minimal in this area. Average investment as a percentage of GDP is considered high, and there is a marked increase in the value of these investments, despite recent declines occurring due to EU sanctions. Russia’s economy is suffering during the last 3 years of high rates of inflation, as a result of a decline in the value of the Russian ruble against foreign currencies, and the standard deviation indicates the projected increases in the value of this rate. Russia is one of the few countries in the world that has low level of debt as a percentage of GDP, but lately, this ratio began to rise. Human development index in Russia is considered a high value, and the value of the standard deviation indicates projected increase in the value of this indicator. Brinkley, I. (2006). Defining the knowledge economy. Knowledge economy programme report. The work foundation. London. http://www.theworkfoundation.com/Reports/65/Defining-the-knowledge-economy-knowledge-economy-programme-report. Access in 3 Aug 2016. David, P. A., & Foray, D. (2003). Economic fundamentals of the knowledge society. Policy Futures in Education Journal. p3. http://citeseerx.ist.psu.edu/viewdoc/summary?doi=10.1.1.123.555. Access in 13 Apr 2016. Meusburger, P. (2013). 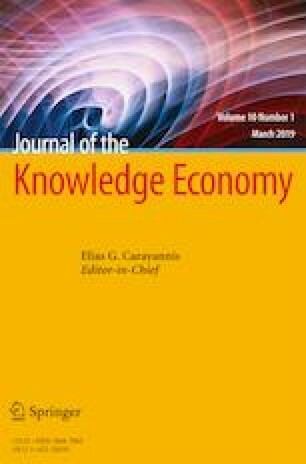 Relations between knowledge and economic development: Some methodological considerations. In P. Meusburger et al. (Eds. ), Knowledge and the economy. (Knowledge and space, Vol. 5, p. 15–42). doi: 10.1007/978-94-007-6131-5_2. Paličková, I. (2014). Influence of the knowledge economy on the economic growth and economic level of countries. Technical University of Ostrava http://www.slu.cz/opf/cz/informace/acta-academica-karviniensia/casopisy-aak/aak rocnik-2014/docs-3-2014/Palickova.pdf. Access on 20 Aug 2016.